The Golden Retriever is the fourth-most popular breed of dog in the United States, after the Labrador Retriever, the hard-to-see-in-the-undergrowth Yorkshire Terrier, and the German Shepherd. Originally bred to retrieve waterfowl (shot by hunters, not escaped from the marsh), the Golden can be very athletic and playful. At rest, the Golden gives every indication that it plans to settle in with a cigar, a snifter of brandy and a good book. 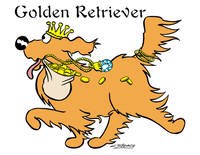 The Golden is beloved for its sweet nature and beautiful coat, and its uncanny ability to look and smell like old money.